These days, clients generally are hard pressed not to find a gluten-free food section in their local supermarket. With 3 million Americans suffering from celiac disease and nonceliac gluten sensitivity, it’s no surprise that food companies are cashing in on the skyrocketing demand for gluten-free foods. In 2010, gluten-free product sales reached more than $2.6 billion and are projected to exceed $5 billion by 2015, according to the National Foundation for Celiac Awareness. Food and nutrition strategic consultant Rachel Begun, MS, RDN, CDN, says there are some notable factors contributing to the rising gluten-free trend. “No. 1 is that there’s definitely an increased awareness of celiac disease [and] gluten sensitivity,” says the founder of The Gluten Free RD blog. “And for better or worse, [there are many] celebrities who are endorsing it as a weight-loss diet and athletes endorsing it as a peak-performance diet” despite the fact there’s no scientific evidence to support these claims. For the average person with celiac disease, buying specialty gluten-free products can come at a steep price since many cost much more than their gluten-containing counterparts. Dee Sandquist, MS, RD, LD, CDE, a spokesperson for the Academy of Nutrition and Dietetics (the Academy), has experienced this problem, as she has celiac disease. “If you think about it, in the past, wheat has been subsidized by the federal government,” and since gluten-free products aren’t made with wheat, they’re more expensive, she says. The other component is supply and demand. “Clearly, the gluten-free market is growing, but it’s not as large as the regular market,” says Sandquist, who opened a specialty gluten-free store in 2005. 1. Stick to cheaper gluten-free carbohydrates. According to Begun, when it comes to purchasing gluten-free foods, it’s the type of grains they contain that are the main cause for concern. These days, ancient grains are all the rage, but there’s nothing wrong with sticking to the more basic options such as corn, rice, and gluten-free oats, which are cheaper. 2. Choose naturally gluten-free foods. The truth is the healthiest foods clients can eat contain no gluten. 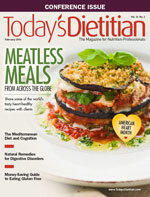 “The best way to save money on a gluten-free diet is to avoid buying as many packaged gluten-free products as possible and buy naturally gluten-free foods such as fruits, vegetables, tofu, nuts, beans and other legumes, eggs, low-fat dairy, and lean meats,” says Marie Keogh, MPH, RD, CDN, a clinical nutrition manager at Sodexo who follows a gluten-free diet. 3. Don an apron. When it comes to cookies and breads, clients will save money if they make their own. “Once you get a sense of how much you can do at home, it gives you the chance to resist the impulse buys,” Hunn says. While most people are intimidated by baking, Hunn recommends encouraging clients to start with a regular drop-cookie recipe, which is foolproof. 4. Become friends with your freezer. Recommend clients make extra batches of gluten-free meals and snacks, and freeze them for a later time. Frozen gluten-free products, such as cookies, can last up to a couple of months as long as they’re stored in an airtight container. For gluten-free bread, suggest clients slice the loaf before freezing. That way, they won’t have to defrost the entire loaf if they just want to eat one or two slices at a time. If clients have bread with a high moisture content, they can place sheets of wax paper between each slice, Sandquist says. 5. Buy in bulk. Suggest patients buy gluten-free specialty foods in bulk. “[And] take advantage of sales and coupons,” Sandquist says. Many of the gluten-free product manufacturers have coupons, so recommend clients search online and peruse supermarket circulars for weekly specials, she adds. Begun also agrees with buying in bulk but cautions against shopping in bulk bins because they may be contaminated with gluten-containing product residue. 6. Make gluten free a family affair. If there’s one person in a household who must eat gluten-free foods, recommend clients buy and prepare gluten-free meals the entire family will like. “This way you can avoid the additional cost of buying gluten-free purchases and regular products,” Begun says. It’s important that shoppers look at the price per ounce when making purchases to determine which products offer the best value. Other supermarket chains, such as Meijer and ALDI, offer store-brand gluten-free items for lower prices, says Lara Rondinelli-Hamilton, RD, LDN, CDE, of the American Diabetes Association, who recently coauthored Gluten-Free Recipes for People With Diabetes. Clients can even find gluten-free snack foods at discounted prices at T.J. Maxx and Marshalls. 8. Create easy one-pot meals. Instead of clients making complicated gluten-free meals every night, recommend they keep it simple. Clients with a busy schedule and who are on a budget can benefit from spending a day or two making simple, gluten-free dishes they can eat throughout the entire week. “Doing things like preparing large amounts of food in advance and eating one meal over a series of days [is a way to save money],” Sherrow says. One-pot meals such as a soup, chili, or stew are all good suggestions. 9. Find deals on the Internet. “There are a few places that you can purchase gluten-free products online and experience savings,” Begun says. For example, Amazon.com sells everything from gluten-free crackers to pancake mixes to toaster pastries. Another good option is GlutenFreeMall.com, which has a specials section that offers reduced-priced gluten-free products. Online food retailer Vitacost.com also has a special gluten-free products section that includes many sale items, and GlutenFreeDeals.com regularly offers discounts. — Jessica Jones, MS, RD, is a nutrition communications specialist and the cohost of Food Heaven Made Easy, a weekly Web series that demonstrates how to prepare nutrient-dense, delicious, and budget-friendly plant-based recipes while providing scientifically sound nutrition information.